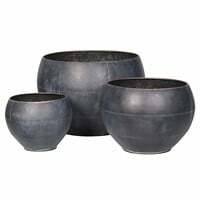 The round shape of these planters allows for ease in placing them in any desired location. Place them together or place in different locations. The circular shape creates a centre piece or focal point in which a plant or small tree can be put on display.